Activists descended on Parliament Square to protest against fracking plans, as MPs voted on the future of Britain's shale gas industry. A vote on fracking in the House of Commons on Monday ultimately ended with the majority of MPs rejecting a moratorium on fracking. 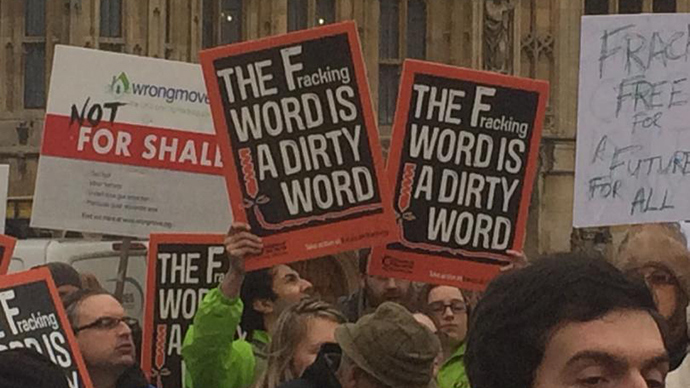 Only 52 voted for a halt of fracking, while 308 were against it. The government, however, banned the controversial activity in national parks and sites of special interest. The protest comes as a group of MPs also warn that fracking must be stopped in the UK because it is “incompatible” with climate change targets and could increase the risk of environmental damage to public health. Celebrities including fashion designer Vivienne Westwood and activist Bianca Jagger, as well as Green MP Caroline Lucas, spoke at the event on Monday afternoon. "For how much are the Tories selling our health, our environment, our water sources, and air down the river to the #FrackingInterests?" It further notes that the continual decrease in carbon budgets under the Climate Change Act mean that by the time shale gas is commercially viable the scope for fossil fuel investments will be significantly smaller. Hope MPs vote against free rein for fracking today in Parliament #nofracking Mr Dunne, please note the level of protest against this. Joan Walley MP, chair of the Committee, said the UK’s sites of national beauty should not be turned into shale drilling sites. “Ultimately fracking cannot be compatible with our long-term commitments to cut climate changing emissions unless full-scale carbon capture and storage technology is rolled out rapidly, which currently looks unlikely,” said Walley. “We cannot allow Britain’s national parks and areas of outstanding natural beauty to be developed into oil and gas fields. Even if a national moratorium on shale drilling in the UK is not accepted there should be an outright ban on fracking in such special sites,” she added. The Committee also proposed further changes to the Infrastructure Bill, including removal of the trespass law which gives companies the automatic right to access land for drilling, and a fracking ban in any biologically important areas such as national parks and ancient woodland. They also call for greater transparency and higher levels of monitoring. The report comes after the chancellor delivered a letter to the Committee urging them to fast-track fracking legislation. The requests include intervening in local planning and gaining public land for future fracking projects. In the Committee report, Walley warned of the rushed changes Osborne is trying to push. “The government is trying to rush through changes to the trespass laws that would allow companies to frack under people’s homes without permission. This is profoundly undemocratic and Parliament should protect the rights of citizens by throwing these changes out when they are debated later today,” she said.